Ideally, the review might even compare the translation to any earlier ones and weigh how this translation offers a new outlook on the original work. Whether it is the first or twentieth translation, the review could also consider how the work itself expands (or not) the literary resources for the target language: much of literature is in fact a dialogue, and this a new voice, or a new rendering of that voice, will speak to readers and writers who could not “hear” it before. That’s the ideal, then there’s the real. I’ve worked on publications, and I know that the ideal shines like a fairytale sunset that only occasionally bathes keyboards with golden light. The rest of the time we labor beneath meager florescent tubes. For example, a review may be limited to a few hundred words and be directed toward readers with narrower interests, or the ideal may be unobtainable for reasons beyond the reviewer’s or editor’s control. In the case of Prodigies, the novel has been out of print in Spanish for twenty years. I bought the only copy for sale in Spain’s national network of second-hand bookstores. Reviewers stand little chance of getting their hands on one anywhere – not to mention the rarity of bilingual reviewers with the time and financial incentive to read both the original and translation. In any case, well-trained reviewers ought to know a little about the art of translation, but I have heard of reviewers so literal that they look up a word in a bilingual dictionary and wonder why the translator sometimes, apparently inconsistently, uses a different one. If in fact the best translator is invisible, our cover can be blown by real or imagined infelicities, while a wonderful translation might slip past like a ninja, unseen. Sometimes, that might be as good as it gets. When I was translating Prodigies with its dreamlike, poetic prose, I knew that at every word I faced more ways to do it wrong than right. I wouldn’t mind a brief acknowledgment that I succeeded (if I did), such as: “Sue Burke has brought Angelica Gorodischer’s poetic, vigorous prose to English.” Instead, I slipped past unseen, and in the end, I’m satisfied (and thrilled) with invisibility and all that it implies. Maia Evrona: Reviewers begin as readers, and I have found that there are mostly two kinds of readers when it comes to books in translation. The first type is the reader who never considers the existence of a translator, and who will heap all blame or praise upon the writer alone. Sometimes, the closest a reviewer of this reading persuasion will come to acknowledging translation is declaring that a given writer “translates well,” as if translation were a passive process that simply happens to literature. The second type is the reader who will remain convinced–no matter how engaging a particular translated book may have been—that he or she has been cheated by the translator and by the very fact of reading in translation. This second type may be someone who has no fluency in a given book’s original language, but he or she may also be someone whose comprehension of that language is rather good. Knowing a language does not mean that one necessarily knows how a given piece of literature should be translated, no matter how much confidence in one’s abilities one may have upon skimming the original. Translation is, like writing, an art but also a process. Thus, I don’t believe that a reviewer must always know the original language of the translation he or she is reviewing, though I don’t deny that such knowledge can be useful—in skilled hands it can be illuminating. I hope that, in the future, more than three percent of the books published in the US will be works in translation, and from an array of languages, and it’s unrealistic to argue that, in every case, the reviewer must be someone who can read the original. And while I’m sympathetic to reviewers who are hesitant to comment on the translation aspect of a work of foreign literature from a language they don’t know, I suspect that they would feel less at a loss if they had some experience in the art of translation themselves. One is less likely to overlook or be unfairly harsh to a translator if one has been a translator, and one is less likely to fault an original writer for weaknesses in translated prose or poetry if one has a sense of the pitfalls into which a translator can stumble—a sense I am still developing after years of translating poetry and prose. There are MFA programs and individual workshops in the US devoted to literary translation, but translation is still not widely seen as an important component of a writer’s education, the way literary criticism often is. Perhaps if it were, reviews of translated literature would improve, though I suppose we may always have critics who bash praiseworthy books—translated and not—as there will be critics who praise undeserving work. 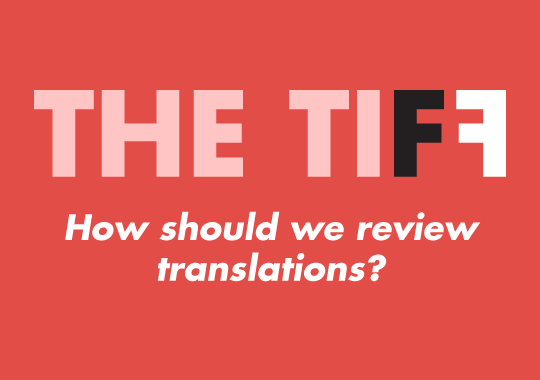 In the meantime, the conversation surrounding how to review works in translation is one we should keep having, and I encourage translators to take any opportunity to educate the reading public on the art of translation. Judging by the responses I have received to some of my published translator’s notes, readers find the translation process to be fascinating once they acquire some knowledge of what it entails. Sue Burke is an American writer and translator living in Madrid, Spain. In addition to Prodigies, a translation of a short story by Nilo María Fabra, “The Dragoon of Montesa,” was published in July by Parsec Ink in the anthology Triangulation: Lost Voices. Her website can be found here. Maia Evrona’s translations of the Yiddish-language poet Abraham Sutzkever were recently awarded a 2016 Translation Fellowship from the National Endowment for the Arts and have appeared in Poetry Magazine, the Kenyon Review Online, and other venues. Her own poems, as well as excerpts from her memoir on chronic illness, have appeared in Prairie Schooner, New South, and elsewhere. name, I feel quite disappointed.